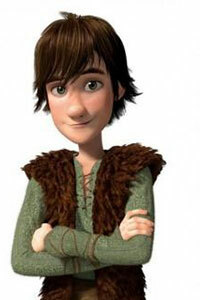 The main character of the story, Hiccup doesn’t physically look like a strong Viking. Despite his small stature, he uses his smarts, leadership and compassion to lead the Vikings and dragons in the battle against the Red Death but loses his left foot in the fight. Hiccup is the first to develop a relationship with a dragon and becomes best friends with Toothless, a Night Fury. He also has a big crush on Astrid.